The Twitter Song Brightened My Day! Give it a listen and let me know what you think! Texting: Does It Help Us Connect With Others Or Does It Creative A Divide? Short answer: I think it helps us connect casually with more people but it is not meant for deep connecting moments. Long answer: Global news hour recently discussed this topic. 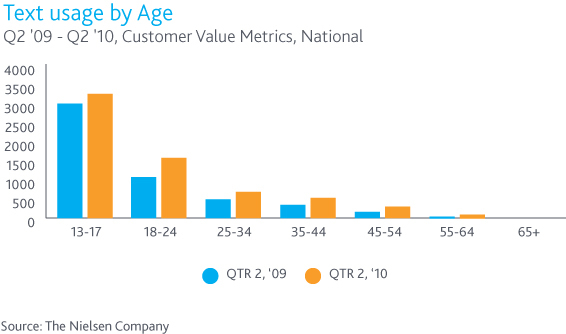 Their bottom line: an in-person conversation for 5-10 minutes is better than mass texting. I agree with this statement on the basis of quality over quantity. Face time over texting is always better but does this mean that we shouldn’t text? No ! I think text messages are a great invention. I almost like them as much as various social media applications. ALMOST. As a Social Media Specialist, I am immersed in web and mobile 2.0 to build community, marketing, interacting and share information. My heart and passion belong with social media but when it comes to texting I’m hooked. Nielson states that there is an 8% increase in texting from 2009 to 2010. What does that 8% really mean? 3,339 texts a months for the average teenager. Adults texting has increased too, not to the same degree as teenagers but there still is a sizeable difference. Look at the chart below from Nielson Wire. I admit, I’m a textaholic. I love texting. I even get my facebook updates via text. I like it because you can communicate with a large group of people instead of being confined to one call at a time. Another benefit of texting is it allows for multi-tasking. Our society is becoming more about time maximization. We even like our devices to have multiple purposes. Look at the once iconic pocket watch, nobody really uses it anymore because it only performs one function. Even its shrunken cousin the wrist watch is declining in popularity; a cellphone/smartphone displays a clock on its screen, which makes a wristwatch redundant (unless you use it as a fashion piece.) To captivate attention and get usage today a device must perform multiple functions. This is why smartphones are becoming increasingly popular as they offer not only phone calls and texting but they also offer internet browsing, emailing, and other various applications. Another reason why texting is rising in popularity: Texting is simple, fast and to the point. You can get a message to someone quickly and get a response back. For example (in text type): Penny: Car brke dwn. I can’t meet u 4 coffee. Gale: Sorry 2 hear that! Ok, nxt time. This takes about 10 seconds to type and send versus a 2-4 minute phone call explaining the situation in great detail. This way “penny” can focus her energies on arranging car repair and Gale knows not to wait for her. Great example of a casual issue that can arise where texting is beneficial. Bottom line: Texting is great for casual interactions. It provides us with a way to interact with a multitude of people at the same time while performing other activities. I love texting for the aforementioned good reasons but don’t hide behind your phone instead of talking to a person; when a problem happens TALK it out don’t type. 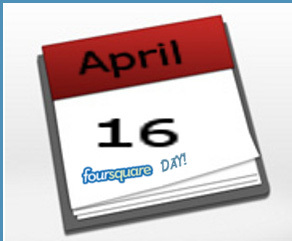 NYC Mayor Bloomberg declares that April 16th is Foursquare day in the city. This means there are roughly 300 cities celebrating the holiday. The location tracking social network gets its own day in New York City. Bloomberg delivered his endorsement on April 14th to the NYC based social network. It is no surprise to hear that New Yorkers as well as many others around the world are enamored with FourSquare. Eight million users strong, FourSquare allows you to ‘check-in’ through your smartphone app or sms. Every time you check in you’re awarded points, which earn you badges. here’s a list of badges. For example: If you earns the badge of mayor it means you have visited that specific venue the most out of others who have checked in at that venue over the past 60 days! The person of this award is continuously changing and some businesses like to offer special discounts or deals to their current FourSquare ‘Mayor’! Should Twitter Have a Like Button? This is the question that came to me last night. I’m pondering the possibilities and the implications. Facebook and Google both have their own type of like button, why doesn’t twitter? Throughout my experience with like buttons I’ve come to greatly appreciate them. Like buttons support the concept of community building. Google recently started their +1 recommendation to give browsers more confidence in their search efforts. +1 is available to those who have a public Google profile. You can ‘like’ or in this case ‘recommend’ places or links to your connections. When I go onto Google and search a topic, if a connection has recommended one of the search results I see it! This is more of a search related liking and less of a social aspect but it brings a social aspect to web searching. On Google’s website: http://www.google.com/+1/button/ they describe +1 as such : “Click +1 to publicly give something your stamp of approval. Your +1’s can help friends, contacts, and others on the web find the best stuff when they search.” The way I see it is helping others strengthens us all. It helps foster support and builds a sense of community. Facebook’s like button serves more of a social, community aspect of liking. As a social media specialist, I love to post updates and links to interesting content on my facebook account. I experience a rush of excitement when someone likes one of my status updates or links I’ve shared. Liking a post says “I agree” or I appreciate what you’re saying and I’m publically stating it to our social world. Liking on facebook builds a positive connection with your friends and it encourages more socializing. People tell me they are more likely to share links and post updates if they receive likes because it makes them feel their efforts are appreciated. In other words: they like feeling popular. Everyone likes to be liked. Liking someone’s link is an extension of liking that person. Facebook capitalized on this by allowing businesses to have a fan page or facebook page for businesses. The like button can be placed on external sites as well encouraging site visitors to ‘like’ them on facebook (this shows support for that business and it benefits facebook as ‘likers’ are using facebook more.) Another recent development is the connection of television advertising to internet browsing. For example: On a tv commercial Aquafina flavoured water advertises its product then encourages viewers to find and like them on facebook. Currently, there are 13,039 people who like Aquafina on their facebook page. coincidence? I think not. So this raises the question should twitter have a like button? I’ve been discussing this topic and received mixed opinions. I’ve been asked what about retweeting? Isn’t that the same thing as liking? Does liking on twitter even fit what twitter is? @xMediaOutlet said “NOPE, retweet is much stronger action than like.” On the other side I’ve heard that it would make twitter even better. @ davemossop called it a “ magic switch.” I fall on the supporter side. I think a like button on twitter would even further foster a sense of community. To answer a previously stated question: retweeting? Isn’t that the same thing as liking? No it is not the same. Retweeting, while it is a way of sharing a tweet you like its main focus is on information sharing. Liking does not share the link with others, it would tell the tweeter that you like what they are sharing. I believe these two functions could operate independently of one another and improve the already great twitter. Another Earthquake? Japan Needs Your Help! Another earthquake hit japan and to make matters worse there is another potential tsunami. I’m asking that if you haven’t donated to the red cross you can do so now @ http://www.redcross.ca/article.asp?id=000043&tid=016 . Twitter May Be The King But Google Buzz Shows Promise!! Microblogging/ information sharing What are my thoughts? My Response “As someone who uses both Twitter and Google Buzz, I am confident in stating that Google Buzz is not a failure. Google has a long road to travel to become a better social network provider, but Google Buzz is a decent first step” For my fellow blog readers: Let’s focus on information sharing/ microblogging. What does Twitter offer? it offers real-time information sharing and online community. Twitter allows mass information sharing in a 140 character space. Thanks to link shorteners like bit.ly it is possible to share websites and a brief message. Since 2006, the phenomenon has grown from an unappreciated social tool into a powerful network of information! Twitter connects everybody: rich and poor, regular joes and celebrities, as well, businesses or business people with their customers. I like to call it the great equalizer! 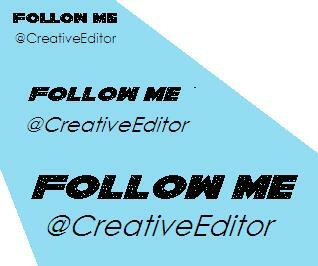 Now, I can follow my favourite authors, actors, companies, and friends. Twitter allows for interaction between follower and followee. These interactions are the reason I’ve dubbed Twitter the great Equalizer! It took a while for twitter to gain credibility and to get the recognition it deserves and the same can be said for Google Buzz. Google Buzz is still in its infancy — just like an infant, it is growing bigger and stronger everyday! I like what I’ve seen thus far in Google Buzz. One great feature about Google Buzz: NO 140 character limit! I can tweet something, link it to my buzz account then further explain it in detail on buzz! Another great feature: I can add in pictures right in the message! I posted a comment and my social media contact information. I’ve been contacted by people who are intrigued by my comment and as a favour to my loyal blog followers I’m sharing my words with you! 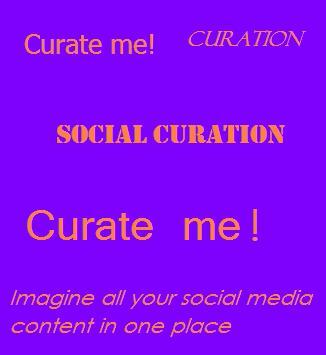 Read the article above if you need a definition of social curation. Web 2.0 and Mobile 3.0 wave are changing the way we receive information and interact with each other.